Re: I have done 2-3 spellings mistakes in ielts. Would it affect my score? If you get the spelling of an answer wrong, you will be marked wrong. Yes, you will get 10 minutes extra time to transfer your answers from the test booklet to the answer sheet. All the best for your Listening test! It doesn't matter where you put the summary. The key point is: you must have one. We believe that it makes most sense/is logical to put it at the end. 1. Getting a test re-marked. 2. Entering wrong information on the IELTS Reading Answer sheet (True/False/Not Given). Re: Are you preparing for the IELTS test? Hi Call me +91-75 98 08 18 49, Provide me your Ph number too..
Re: I want to ask what will be the time schedule for classes? Because i am working. Hi Nimisha - nice to 'meet' you! Scott's English Success has helped many thousands of students prepare for the IELTS test for over 10 years. Our website exists to thoroughly prepare you for the IELTS test. We offer an online classroom experience, a test Practice Lab (consisting of Listening, Reading, Writing and Speaking practice tests) and a Resource Library for further practice of your skills. You can study at your own pace, 24 hours a day, 7 days a week. Once you have finished studying our course, we believe you will be well prepared to take the IELTS Academic or General Training Exam. The following YouTube video will give you more information about our course: https://www.youtube.com/watch?v=61VnguC-ts0. We have designed our courses over several years and focus students on the key aspects of all four sections of the test. Our students tell us that our ‘Standard’ plan - $49.00 USD for 1 month and our ‘Premium’ plan - $89.00 USD for 2 months represent good value. Simply go to (http://www.scottsenglish.com/ielts/enrol_1.asp) and start preparing for IELTS success. Whether you choose to study with us or not, we take this opportunity to wish you the very best for your IELTS test! Re: printing out practice test? In order to simulate exam conditions, you may print out one copy of our tests for personal use. However, you cannot download or save them at all. All the best for your IELTS test! Re: How can I be successful with all the question types of IELTS reading? We have a number of practice reading 'mini tests' in the 'Reading' section. Do you know all the different IELTS reading question types? If not have a look here. We just added a new question try this one. Once you have studied the above key IELTS Academic Task 1 words, write your first two (2) paragraphs by summarising the information and selecting and reporting the main features, making comparisons where relevant . Once you have attempted writing the first two paragraphs, check the sample. 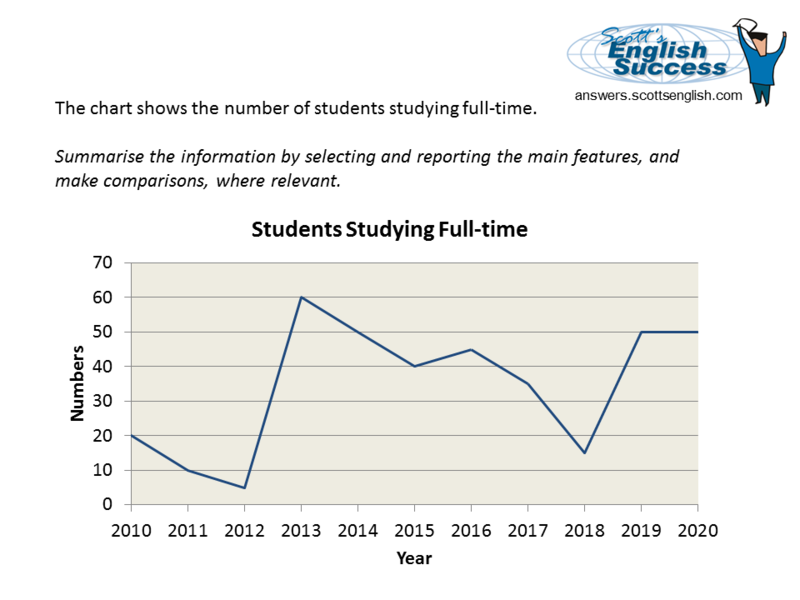 The graph shows the number of students studying full-time. The period begins in 2010 and ends in 2020. It can be seen that from 2010 to 2012 there was a steady fall in the number of students studying full-time. However, from 2012 to 2013 there was a dramatic increase in full-time student numbers - rising from around 5 to 60. From this point, a significant fall to 40 followed by a slight increase can be seen. The downward trend is expected to continue, with numbers falling from 60 in 2013 to 15 by 2018. There will be a strong recovery from 2018 to 2019 with numbers rising to 50 and this number will remain stable until 2020.